Billy Graham and Johnny Cash visit backstage during the 1985 Ft. Lauderdale Crusade. Cash began performing at Crusades in the early 1970s, just a few years after he came to faith in Christ. September 12 marks 13 years since country music legend Johnny Cash passed away. 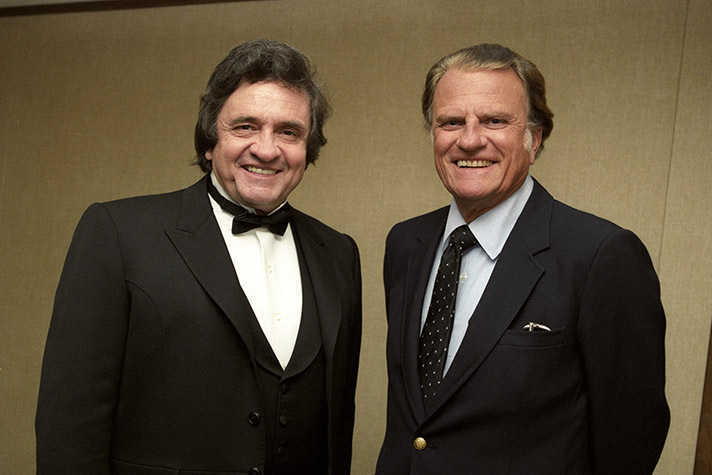 “Johnny Cash was not only a legend but was a close personal friend,” Billy Graham once said. “Johnny was a good man who also struggled with many challenges in his life. Johnny was a deeply religious man. He and June came to a number of our Crusades over a period of many years. As we commemorate Cash’s home-going and celebrate his life and his faith, learn about the role his family played in his surrender to Christ, and read about a friendship that gave him another platform to share the hope he found. That’s what grave site visitors read on Johnny Cash’s tombstone, just outside of Nashville. And it’s what he urged audiences at numerous Billy Graham Crusades to do—in a manner of speaking. “Meet Me in Heaven” is also the title of a song inspired by Cash’s brother, Jack, who died an untimely death—and could very well have planted the seed of the Gospel in his younger brother’s heart. Jack suffered fatal injuries from a table saw accident in Dyess, Arkansas, where the seven Cash siblings grew up. Carrie, their mother, prayed fervently over all her children, but it was Jack—the third child and one ahead of Johnny in the birth order—who was the evangelist in the family. But it would be more than 20 years from that moment before the Man in Black would see the light. Those years would see the peaks of his fame and career success, but it would also see the dark valleys of his drug and alcohol addiction. Through it all, his family never wavered. And they never stopped praying for him. “We lived in Memphis, and Uncle Johnny would occasionally come through town since he lived in Nashville. Mother always witnessed to him, prayed for him and tried to talk to him about Jesus,” Garrett remembered. 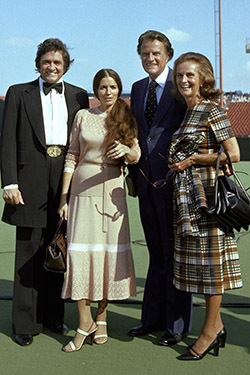 Johnny and June Carter Cash pose with Billy and Ruth Graham in the venue prior to the 1978 Kansas City Crusade. Cash’s faith remained intact, despite his struggle with old habits and encounters with demons from the past. 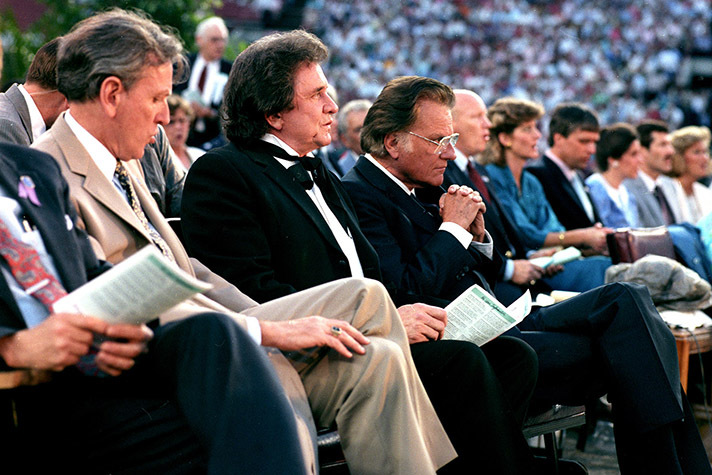 In the early 1970s, Billy Graham got word of Cash’s relatively new faith and invited him to be a part of Crusade events. Billy Graham also invited Cash into what became a friendship that only strengthened as the two men grew older. Together with their wives, they visited one another’s homes and spent vacations together at Cash’s property in Jamaica. “I remember Uncle Johnny saying to me that he had started going to Billy Graham Crusades—that he would sing and share his testimony. 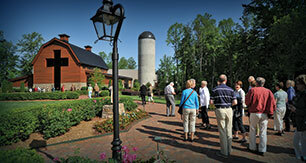 He made that a top priority—a higher priority than concert tours,” Garrett said. While many may say Johnny Cash was instrumental in their music careers, numerous people have credited his witness to their faith in Christ. There was a graveside memorial service in 2014 to dedicate a new grave marker at Johnny Cash’s burial site. As Garrett—a minister—conducted the ceremony, he opened up the floor for the 200 in attendance to share any thoughts or memories that would honor his uncle. “Only someone who has had such a problem (as substance abuse) can have complete love and compassion and understanding for such people. I love drug addicts. And I love alcoholics. When Jesus said He was sent to heal the brokenhearted and preach deliverance to the captives, I believe these were some of the people he was talking about.